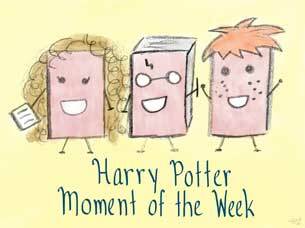 Harry Potter Moment of the Week is a meme created by Uncorked Thoughts and hosted by Lunar Rainbows Reviews. The aim of this meme is to share with fellow bloggers a character, spell, chapter, object or quote from the books/films/J. K. Rowling herself or anything Potter related! A list of upcoming topics can be found here. Best Moment of Pure SASS? Two of my favorite sass-filled moments involve both Harry and Snape: when Snape catches Harry with the Marauder's Map in Prisoner of Azkaban and the Map insults Snape, lol, and of course the classic "There's no need to call me 'sir,' Professor" line from Half-Blood Prince. YES- the pincers! XD HBP was just on TV, and I laughed at that for like the millionth time. It NEVER gets old! Those sound fun! I really need to catch up on the movies (or the books!!!) at some point.